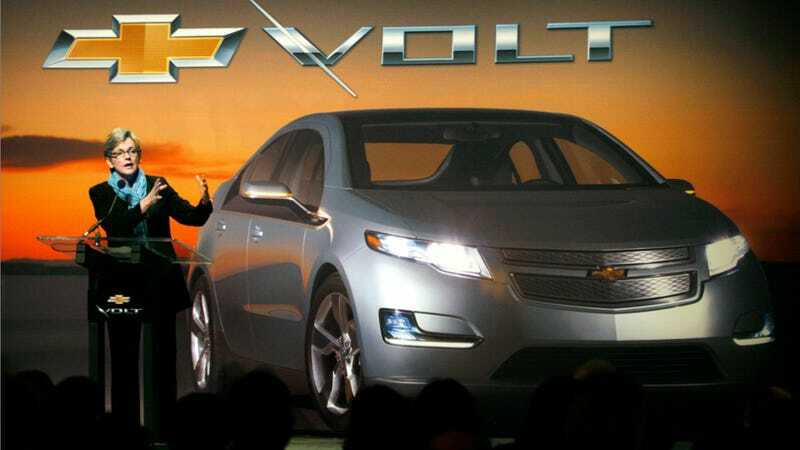 The total amount of state and federal subsidies for each Chevy Volt sold is as much as $256,824 per vehicle according to a fiscal analysis by Michigan's Mackinac Center for Public Policy. All for a car that only costs $39,828. To get to this number analyst James Hohman looked at 18 government programs (rebates, grants, loans, tax credits) and divided that number by the amount of Chevy Volts sold thus far. There's a total of $3 billion in subsidies including $2.3 billion in federal money and $690.4 million offered by the State of Michigan. Divide into that the 6,000 (or so) Volts sold thus far and you arrive at their number. Or,actually, you arrive at a number closer to $500,000. The math's a little fuzzy. It's unlikely that all the companies involved in Volt production will ever receive all the $3 billion in incentives, Hohman said, because many of them are linked to meeting various employment and other milestones. But the analysis looks at the total value that has been offered to the Volt in different aspects of production – from the assembly line to the dealerships to the battery manufacturers. Some tax credits and subsidies are offered for periods up to 20 years, though most have a much shorter time frame. This figure also wouldn't pass an MBA accounting course as it assumes that you're only going to sell 6,000 cars. Ever. It's artificially low because some of these subsidies are 20-year grants. If they sell only 6,000 cars a year for 20 years that number comes down to $25,000 per car. Boeing spent $10 billion developing the 777. If they only sold ten of those, they spent $1 billion per aircraft. They've actually sold about 1,000 of those, for a price of $10,000,000 per plane thus far. Given the $200 million base price, we'd all agree that's a pretty decent investment. You can play with the math all day because it's mostly made up and even includes tax breaks, which doesn't involve the government paying money to the company, but merely not collecting taxes from them. And since this money is being spent trying to speed up our nascent battery production infrastructure — a large portion of the subsidies go to battery suppliers — so it can catch up with the rest of the world it's possible this $3 billion is actually a smart investment in an important future industry.